If you’re going the traditional route, your basic formalwear decisions will be dictated by the time and formality of the affair. If you’re renting, don’t wait until the last minute - all the best tuxes will be gone. Plan to reserve all formalwear around the three-or four-month mark and pick it up a few days before the wedding. The average tuxedo rental is $50 to $200, depending on the style where you rent from. Rental generally includes a jacket, trousers, shirt, vest or cummerbund, studs, cuff links, and a tie. If you have reason to wear a tuxedo at least two or three times a year, it might pay for you to buy one for your wedding -they run $300 to $700. Wear a basic black, nondesigner tux. A formal tailcoat or daytime cut-away coat will cost more. 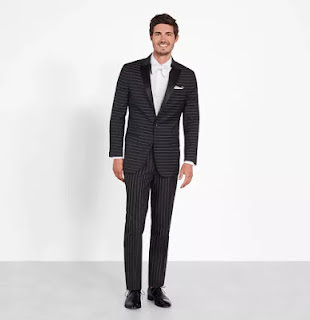 If your wedding is semi-formal, the groom and groomsmen can wear nice suits they already own. If you’re all renting at the same place, you should get a certain amount off, or the groom’s rental may be free. Rent all the groomsmen’s tuxedos from the same store. Ask the shop for measurement cards to send to out-of-towners. Make sure they have time to visit the formalwear store a day or so before the wedding for a final fitting. Groomsmen pay for their own rentals, but it’s a good idea to place one big order and get paid back. Don’t rely on everyone to make their own arrangements- it won’t happen. If the bride is wearing a pure white dress, the guys should wear ivory. To make sure your formalwear fits correctly, check the following: (1) with arms at sides, the jacket hem is not longer than the tips of your fingers; (2) your shirt just peeks out from the jacket sleeves; (3) the jacket sleeves hit the tips of your hands; (4) your pants touch the heels of your shoes and have a small fold in front over the shoes; (5) you can squat without splitting the seas; and (6) you can comfortably lift your arms to just below shoulder height. Along with the best man, try on styles you like and decide whether the groom’s outfit will be slightly different from the rest of the men’s. Make final decisions(s) on your formalwear. Get measured and have the best man and other groomsmen come in to do the same; have out-of-town groomsmen send their measurements. Decide what size(s) to order. Ask to see the manufacturer’s sizing chart yourself. Choose the size that fits each groomsmen’s largest measurement.